The South Dakota State Historical Society recently received a collection concerning Chief Spotted Tail. The collection consists of 14 pieces of copied documentation and one photograph copy concerning Chief Spotted Tail, noted Matthew Reitzel, manuscript archivist with the State Historical Society-Archives at the Cultural Heritage Center in Pierre. The items were in the possession of Spotted Tail’s great granddaughter, Mary Jane Spotted Tail and donated to the State Historical Society by her nephew, Trudell H. Guerue, Jr., of West Saint Paul, Minn. The copied documents feature correspondence and government certificates regarding Spotted Tail, said Reitzel. The correspondence was either sent to Spotted Tail or concerned him in some way. Spotted Tail, a Lakota Sioux American Indian, was one of the leaders who signed the Fort Laramie Treaty of 1868, designed to bring peace between the whites and the Sioux who agreed to settle within the Black Hills reservation in the Dakota Territory. Spotted Tail settled with his people on what would become the Rosebud Indian Reservation and remained a powerful leader until his death in 1881. 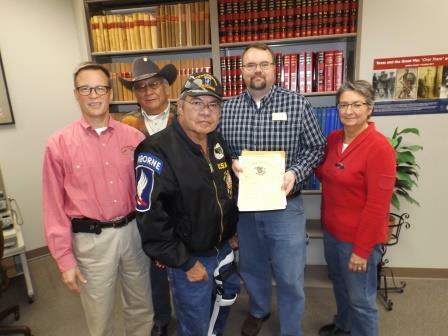 Suggested photo cutline: Present for the donation of the Spotted Tail collection to the South Dakota State Historical Society were, from left, Jay D. Vogt, society director; Francis Whitebird, a society trustee; donor Trudell H. Guerue, Jr.; Matthew Reitzel with the Historical Society Archives; and Jeanne Ode with the Historical Society Press.